20% off the price of the separate titles, this new pack delivers great value on these popular posters. Posters are an excellent way to communicate to workers easily, effectively and pictorially. 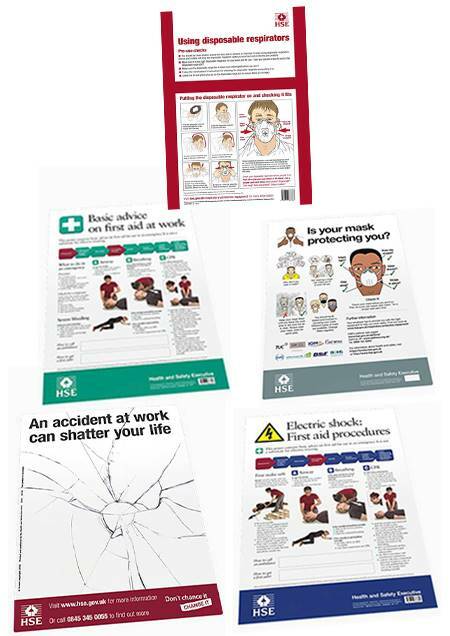 This poster shows basic first aid procedures, designed to help employees deal with first aid incidents at work. It incorporates recommendations from the European Resuscitation Council on resuscitation and first aid. Is Your Mask Protecting You? Employers have a duty to provide the right equipment to help employees work safely. This new format of INDG460 is presented as a graphic poster which can be displayed at sites where masks should be used. The poster can be used as a reminder to employees to wear masks and as a guide to wearing them effectively. Do your workers wear a face mask at work? Do they fit their mask properly? Do they always wear their mask when they should? Do they check it and look after it properly? The original, pocket card version of INDG460 is available in packs of 20. This is a pack of poster stickers which can be displayed in the work environment. It reinforces and personalises the safety message of "Shattered lives". The clear, see-through poster can ideally be affixed to mirrors to reflect back to the viewer that they will be the one with a 'shattered life'. It can also be used on glass surfaces such as partitions in offices and indoor premises.